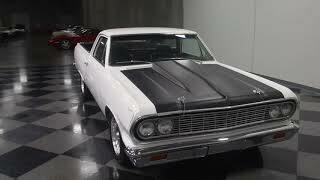 Hi, I am interested in your 1964 Chevrolet El Camino (stock #4679-ATL) listed on Autotrader for $20,995. I'd like to get more information about this vehicle and confirm its availability. For three decades, the El Camino was a bona-fide hit for Chevy, and today they can be some of the coolest old cars youre likely to see. This slick two-tone 1964 Chevrolet El Camino brings all the usual high-performance tools to the table, plus a unique twist on tradition. Two-tone paint jobs from the factory are nothing new, but I dont think theres ever been an El Camino that looked as cool as this sitting in a Chevy showroom. The 1964 El Camino was a subtle machine, with simple, clean lines that echoed its more common passenger car siblings. But look a little closer at this one and youll see things like the black cowl-induction hood, subtle pinstriping on the corners, and the wicked stance. The paint is in good condition, with white being easy to maintain so it will look good for years to come, and it really emphasizes the Elkys compact dimensions. Other than the hood, however, there are no deviations from the factory setup, and all the trim is brightly polished. Even the bed remains in very good condition with satin black paint and a built-in fuel cell in back, adding to the cars racy attitude. Its especially cool to see buckets and a console in an El Camino. Finished in black cloth, the high-back bucket seats look right at home in the cabin, and offer a diamond pattern thats quite reminiscent of other performance machines. Original door panels were installed at the same time and the factory hardware was retained throughout. The original dash is nicely preserved with modern Dolphin gauges set into a custom panel, and the effect is that it looks almost stock but delivers a high-tech view of the engines vitals. Theres also a handsome Grant GT steering wheel with a wooden rim, a T-handle shifter for the 4-speed manual gearbox, and those trick aluminum pedals that are just there to look cool. The engine is an aluminum-headed 355 cubic inch V8 that has been dressed and detailed to look like a million bucks. The block wears traditional Chevy Orange paint, and the satin black engine bay is brightened using polished aluminum valve covers and an open-element air cleaner, both of which look great on the warmed-over small block. Go-fast parts include a Quick Fuel 4-barrel carburetor, an MSD ignition system with Mallory distributor, and a high-rise intake. Theres a positively massive aluminum radiator up front, so heat will never be an issue with this one, and a new chrome alternator makes the juice. A set of long-tube headers dumping into a nicely crafted dual exhaust system with Flowmaster mufflers and a crossover tube help bolster low-end torque for awesome performance and a thrilling sound. The chassis shows signs of recent work, and zero evidence that this truck/car has ever been rusty. New control arms and shocks help manage the rear end for arrow-straight launches, and it sits on a set of vintage-looking Torque Thrusts with 195/65/15 front and 215/70/15 rear performance radials. A nice little truck with a few surprises up its sleeve, this El Camino is a great way to have fun without spending a fortune. Call today!